Three days after being in the middle of one of the biggest trades in NFL history, RB Herschel Walker (pictured above) took the field for the Minnesota Vikings as they hosted the Green Bay Packers on October 15, 1989. In a complex transaction that ultimately involved 18 players and draft picks, Walker was obtained from the Dallas Cowboys. From the perspective of the Cowboys, the deal provided the opportunity to rebuild a last-place team through the draft. For Minnesota, it was hoped that the talented Walker would be the key to reaching the Super Bowl. Much had been expected of Walker since he first gained attention as a freshman on Georgia’s 1980 national championship team. After winning the Heisman Trophy as a junior, he made the stunning move of passing up his last collegiate season for the new United States Football League and, over the course of three years with the New Jersey Generals, rushed for 5562 yards. Moving on to the Cowboys after the demise of the USFL, he was selected to the Pro Bowl twice and, in 1988, gained 1514 yards on the ground and 2019 overall. To be sure, Walker had drawn his share of criticism for being a strictly straight-ahead, no-polish runner who had yet to fulfill gigantic expectations, but he was also a tremendous athlete with outstanding strength and speed. It was anticipated that, having practiced only twice with the team since the trade, he would see limited action in his first game with Minnesota. Beyond Walker, the Vikings, coached by Jerry Burns, were a talented football team with an outstanding defense but an offense that seemed to be underachieving. QB Wade Wilson had a fractured hand and former starter Tommy Kramer was back behind center, and WR Anthony Carter and TE Steve Jordan were playing but hampered by injuries. Coming off an 11-5 record in ’88, Minnesota was 3-2 and willing to mortgage the future for near-term success. The Packers, also at 3-2, were a rejuvenated team under Head Coach Lindy Infante. The offense had been highly productive with Don Majkowski taking over at quarterback, WR Sterling Sharpe breaking out as the feature receiver, and RB Brent Fullwood carrying the running load, and the defense featured pass-rushing LB Tim Harris. There was a record crowd of 62,075 in attendance at the Hubert H. Humphrey Metrodome. The Packers had first possession but Minnesota got the ball on a fumble by Brent Fullwood that was recovered by DE Chris Doleman at the Green Bay 34. The Vikings were unable to capitalize, however, as they were unable to move on offense and a field goal attempt by Rich Karlis from 51 yards was wide to the right. Green Bay responded by driving 66 yards in nine plays, the big one a pass from Don Majkowski to Sterling Sharpe that covered 51 yards to the Minnesota 10. A face mask penalty on LB Mike Merriweather helped to convert a third down and RB Herman Fontenot finally ended the series with a one-yard touchdown carry. Chris Jacke added the extra point to give the visitors the early 7-0 lead. With the crowd cheering as he came onto the field, Herschel Walker touched the ball for the first time on the ensuing kickoff and returned it 51 yards, although it was for naught when nullified by a penalty for an illegal block. The teams exchanged punts and Walker provided some excitement when, on his first carry from scrimmage, he took off for a 47-yard gain to the Green Bay 28, losing his right shoe along the way, and this one counted. But again the Vikings came up empty when FS Ken Stills intercepted a Tommy Kramer pass on the next play. Minnesota took charge on defense with a stuff and a sack to push the Packers back to their eight yard line to finish the opening period, and on a third-and-22 play to start the second quarter, Majkowski’s pass was intercepted by CB Reggie Rutland. The Vikings advanced 45 yards in eight plays, with Kramer completing passes to WR Hassan Jones for 19 yards and to Anthony Carter for 15, and this time Karlis got them on the board with a 28-yard field goal. Once again the Minnesota defense pushed the Packers back, with Doleman sacking Majkowski for a seven-yard loss, and a punt was returned 17 yards by WR Leo Lewis to give the Vikings favorable starting field position at the Green Bay 49. Walker had two carries for 11 yards and, in between, Kramer connected with RB D.J. Dozier for a gain of 30 yards. 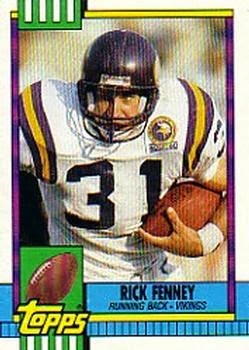 FB Rick Fenney ran eight yards for a TD and, with the PAT by Karlis, Minnesota was in the lead by 10-7. Another short series by the Packers in which they remained bottled up inside their ten yard line was followed by a punt, but while the Vikings reached the Green Bay 30, a 47-yard field goal try by Karlis was blocked by CB Ron Pitts. RB Keith Woodside provided some offense for Green Bay by breaking away for a run of 31 yards, but Majkowski threw a pass that was picked off by Rutland. With the ball at the Green Bay 28 and 2:40 remaining in the half, the Vikings chipped away and Kramer threw to WR Jim Gustafson for a six-yard touchdown. Karlis converted and Minnesota took a 17-7 lead into halftime. Don Majkowski had completed only two of 11 passes thus far and was sacked three times. The teams traded punts to start the third quarter. The Vikings put together an eight-play, 78-yard drive on their second possession as Kramer completed five passes, the longest to Jones for 39 yards to the Green Bay 11 and the last to Fenney for an eight-yard TD. Karlis converted and Minnesota was leading comfortably by 24-7. The Packers once again found themselves playing deep in their own territory when a penalty on the ensuing kickoff had them starting off at their 12 and, after two passes were incomplete, Majkowski was sacked in the end zone by LB Ray Berry for a safety, thus adding two more points to Minnesota’s lead. 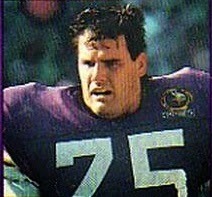 Following the free kick, Walker ran the ball three times for 41 yards to reach the Green Bay 27, but a fumble on an errant pitchout by Kramer was recovered by LB Brian Noble on the final play of the period. The teams exchanged punts before the Packers, gaining possession with 4:47 left to play, put together a scoring series. Majkowski completed passes to Sharpe for 31 yards and WR Carl Bland for a 46-yard touchdown, but the try for an onside kick was recovered by the Vikings, who were able to run out the clock. Minnesota won by a final score of 26-14. The Vikings outgained Green Bay by 398 yards to 219, with 238 of that total coming on the ground. They also had the advantage in first downs by 21 to 11. Minnesota’s defense recorded eight sacks, to one by the Packers, four of them by DT Keith Millard (pictured at right). The Packers turned the ball over three times, to two by the Vikings, and hurt themselves further with 11 penalties, at a cost of 77 yards, although Minnesota was flagged nine times. Herschel Walker rushed for 148 yards on 18 carries, becoming the first player to debut with a hundred yards rushing in franchise history. Tommy Kramer completed 14 of 24 passes for 172 yards and two touchdowns, giving up one interception. Hassan Jones caught four passes for 68 yards and D.J. Dozier was right behind with four receptions for 47 yards in addition to his 31 rushing yards on 8 attempts. In addition to Millard’s four sacks, Chris Doleman had two and Najee Mustafaa accounted for both Minnesota interceptions. For the Packers, it was a long day for Don Majkowski, who was successful on just 9 of 24 throws for 198 yards and a TD with two interceptions, in addition to the sacks. Keith Woodside led the team with 36 rushing yards on three carries as well as three pass receptions, which added another 23 yards. Sterling Sharpe gained 82 yards on his two catches. Alas, the initial excitement over Walker’s impact gave way to disappointment. He never came close to the rushing yardage total of his debut in the remaining games of the season, with 89 the next week at Detroit his next best amount. 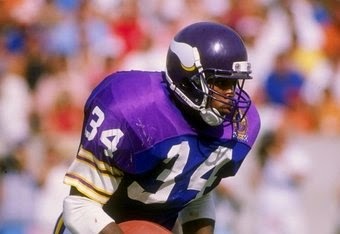 In 11 games with the Vikings, Walker ran for 669 yards in 169 carries for an even 4.0 average and five touchdowns, often looking tentative in the offense. He also was rarely used as a receiver, despite great success out of the backfield in New Jersey and Dallas, catching more passes in his five games with the Cowboys (22) than with Minnesota (18). He would play two more years for the Vikings and remained a poor fit. Minnesota played well at home (8-0) but not on the road (2-6) and, while topping the NFC Central with a 10-6 record, the Vikings lost badly to the 49ers in the Divisional playoff round. They dropped to 6-10 the following year, and rebounded only mildly to 8-8 in 1991, with the Walker trade receiving much of the blame for the club’s decline. By contrast, the Dallas Cowboys, recipients of the load of draft choices from Minnesota, they were able to move up quickly from 1-15 in 1989 to the first of three NFL titles in four years by 1992. As for the Packers, they lost again the next week but beat the Vikings later in the season in the rematch and also finished at 10-6, although in second place and out of the postseason due to tiebreakers.